It may sound like the title of a children's science fiction novel -- "My Teacher is a Robot!" -- but advances in artificial intelligence, 3D animation, and robotics may be bringing that fiction a lot closer to reality. South Korea is actively pursuing the development and implementation of robot instructors, and the country's Education Ministry has stated its goal of having a robot instructor in every one of its 8,400 kindergartens by the end of 2013. Avatars can be repositories of infinite amounts of information and expertise, engage learners by taking on different personas, and serve as tutors for individual students. Trials with robot instructors have been ongoing in both South Korea and Japan. Hoping to spark an interest in science, technology, engineering, and math by discussing robotics with robots, the Japanese have placed robots in high school classrooms. The South Korean trials have been more varied and aimed at a younger audience. Some of these robots sing songs with students, and can hold scripted conversations. But the operative word here is "scripted," and these robots don't really allow for spontaneity on the part of students. If you deviate from the script, the robot isn't advanced enough to follow. Yet. Other robots that are being tried in South Korea are using telepresence instead of artificial intelligence to handle instruction. These egg-shaped robots, called EngKey, have been developed by the Korean Institute of Science and Technology as part of a larger effort to automate English-language instruction in the country. 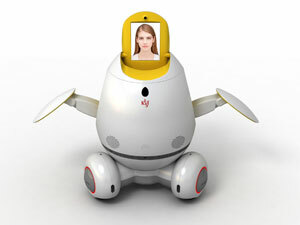 The EngKey robots have a video screen for a head, and they project both audio and video from real instructors. These instructors are actually based elsewhere (often in the Philippines), and while the robot does allow for real-time communication between teacher and student via audio, the image that's broadcast isn't of the instructor -- it's a computer-generated avatar. But these science-fiction-meets-reality stories aren't just occuring in Asia. Avatar teachers may be coming to an American school near you. At least that's the goal of Intellitar, an Alabama-based technology company that's working to "digitally clone" educators and knowledge sources to make them more accessible to students at any time, from any place. An article in eSchoolNews examined the company's work building "intelligent avatars." These avatars look uncannily like their human counterparts, not just in appearance but in mannerisms. The company is working on an artificial intelligence engine that can capture "thoughts, experiences, ideas, and personality traits of the person who is being cloned. Intellitar complements the avatars with 'alternate knowledge sources' to fill in gaps." 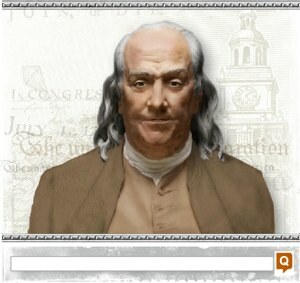 The company has a demo version with a Ben Franklin avatar who blinks and smiles and responds to inquiries about colonial America and the Declaration of Independence. The Hall of Presidents has long been a popular Disney destination, and this sort of mechanized and virtualized creation has a number of applications for museums. But what's the purpose of a robot in a classroom? According to the article, the avatars can be repositories of infinite amounts of information and expertise, they can engage learners by taking on different personas (such as Ben Franklin), serve as tutors for individual students, and even as a source of information for parents. Intellitar CEO Don Davidson considers the robots as helpful tools for teachers. Of course, we're really still at the beginning of development of the artificial intelligence necessary to make this sort of avatar instruction possible. But a robot has now beat the human champions at chess and at Jeopardy. How long before they become our teachers? To paraphrase Jeopardy champion Ken Jennings, should we welcome our robot teacher overlords?